Do You Need Comments or Conversation? | AthenaBridge | Intelligence, connected. « “Apps for Innovation” 3rd Place Finalist! Do You Need Comments or Conversation? There’s a big difference between comments and conversation online. Sometimes comments are more useful and sometimes conversation is more useful– each method has its place, and choosing the right one depends on the purpose of your outreach effort. Comments are great for brainstorming and getting a lot of ideas quickly; conversation is more appropriate for in-depth problem solving and for helping participants ask each other questions and learn from each other. With AthenaBridge, we’re focusing on the conversation side of the spectrum, because our national dialogue leaves much to be desired. Interest groups have no option except to simplify an issue to fit it into sound bites and the subject lines of emails. This helps get attention for individual issues, but it does a disservice for the health of our democracy in the long-term. We’re excited to see the possibilities that the Open Government Directive and “Gov 2.0” create. Government agencies and elected officials can effect lasting change when they open spaces for citizens to connect, converse, and learn from each other. Through conversation, we can learn from each other. 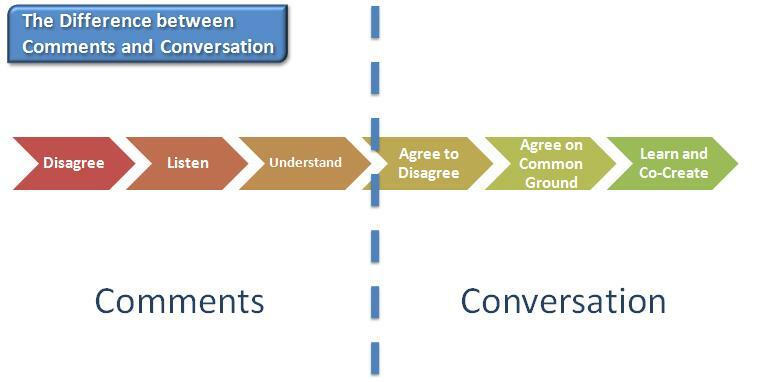 Does the above diagram represent how you see comments and conversation? How would you improve it? Also, you may be interested in these other articles about the AthenaBridge Philosophy. This entry was posted on February 7, 2010 at 2:01 pm and is filed under AthenaBridge, Townhall meetings. You can follow any responses to this entry through the RSS 2.0 feed. You can leave a response, or trackback from your own site.